I made this succulent wreath for a magazine shoot a few years back. Unlike fresh flowers, you can make this well in advance because succulents pretty much last forever (provided you give them the occasional water). 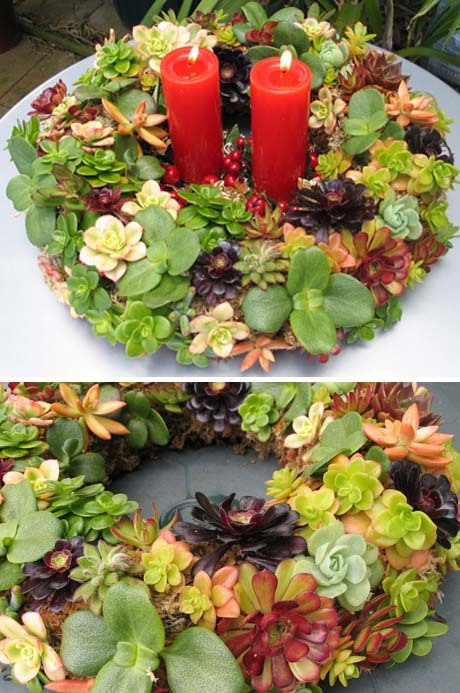 All you need to make this wreath is chicken wire (shaped into a 3-D ring), sphagnum moss to line the ring, and free-draining succulent mix to fill it. Then it’s just a matter of poking the succulent cuttings into the wreath. Super easy. Merry Christmas Jane. Love getting your page each week, so glad I signed up. Merry Christmas to you too, Judy!